1. 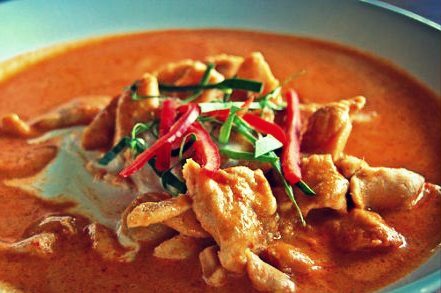 Mix together the coconut milk, peanut paste, broth, soy sauce, vinegar, brown sugar, curry paste, ginger, garlic and red chilli powder. Pour into sauce pan and bring to a boil, then simmer for about 15 minutes. Keep stirring. Foodnote: Easiest way to make sure any cooking turns out right is always to keep tasting. Check your coconut milk mixture and make sure you like how it’s turning out. If not, feel free to add more of anything you think you need. 2. Preheat oven to 180°Celsius. 3. Drop the flour and some salt and pepper into a bowl, whisk to mix. Pop your chicken pieces into this flour mix and coat evenly. 4. In a skillet, cook your chicken in hot oil till brown (keep turning so you don’t burn one side!). When nice and brown transfer to your baking dish. Pour your coconut milk mixture on top and plunk into an oven for about 30 minutes. 5. Sprinkle with cilantro or finely chopped up carrots and cucumber. Serve with hot cooked rice.